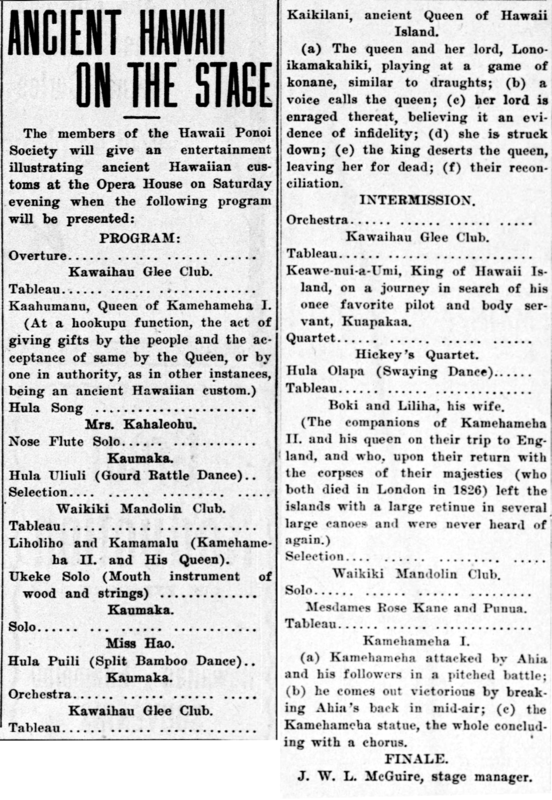 Hawaii Ponoi Society performance, 1907. 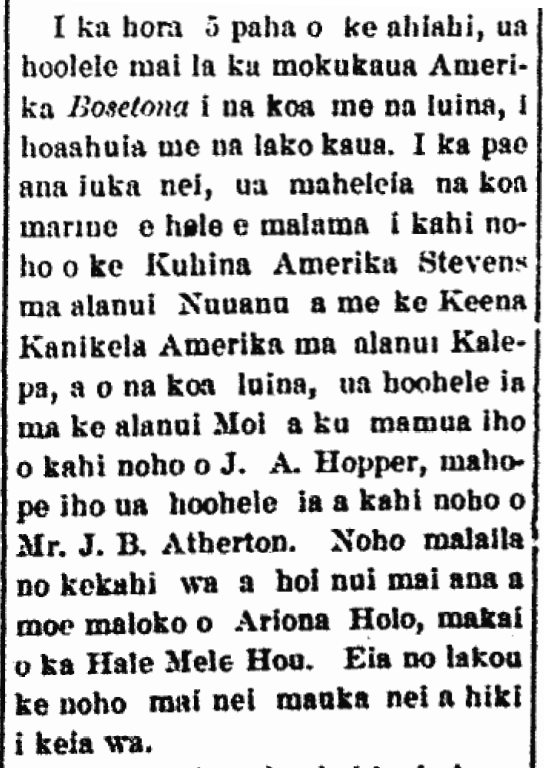 Kaahumanu, Queen of Kamehameha I.
Liholiho and Kamamalu (Kamehameha II. and His Queen). Kaikilani, ancient Queen of Hawaii Island. (a) The queen and her lord, Lonoikamakahiki, playing at a game of konane, similar to draughts; (b) a voice calls the queen; (c) her lord is enraged thereat, believing it an evidence of infidelity; (d) she is struck down; (e) the king deserts the queen, leaving her for dead; (f) their reconciliation. Keawe-nui-a-Umi, King of Hawaii Island, on a journey in search of his once favorite pilot and body servant, Kuapakaa. Boki and Liliha, his wife. Mesdames Rose Kane and Punua. (a) Kamehameha attacked by Ahia and his followers in a pitched battle; (b) he comes out victorious by breaking Ahia’s back in mid-air; (c) the Kamehameha statue, the whole concluding with a chorus. J. W. L. McGuire, stage manager. The Pacific Commercial Advertiser, Volume XLV, Number 7675, Page 6. March 15, 1907.